UPDATE 2/9/17: Viewership for NBC’s Super Bowl LII presentation has increased by more than 12 million viewers based on a new preliminary “out of home” viewing metric issued by Nielsen. “Out of home” viewership has been previously reported, but never before within four days of a live event. With the Nielsen “out of home” figure added, Super Bowl LII now registers a Total Audience Delivery of 118.2 million viewers, across all platforms – NBC, NBCSports.com, the NBC Sports app, NBC.com ‘TV Everywhere,’ Universo, En Vivo app, NFL.com, NFL Mobile from Verizon, the Yahoo Sports app, and go90. The “out of home” metric for Super Bowl was calculated based solely on viewership of the NBC broadcast (6:31-10:25 p.m. ET), and accounts for a 12% lift for the NBC delivery to an average of 115.6 million viewers (from the 103.4 million viewers reported on Monday). The Eagles’ win over the Patriots in Super Bowl LII gave NBC a Total Audience Delivery of 106 million viewers across all platforms (NBC, NBCSports.com, the NBC Sports app, NBC.com ‘TV Everywhere,’ Universo, En Vivo app, NFL.com, NFL Mobile from Verizon, the Yahoo Sports app, and go90), according to Nielsen Fast Nationals and Adobe Analytics. The numbers do not include Out Of Home Viewers, which will not be available until Thursday from Nielsen. Solely counting NBC’s TV audience, that game averaged 103.4 million viewers, down 7% from Super Bowl LI last year and the smallest audience for a Super Bowl since 2009, when the Steelers beat the Arizona Cardinals 27-3, averaging 98.7 million viewers. The games posted a 43.1/68 rating/share. 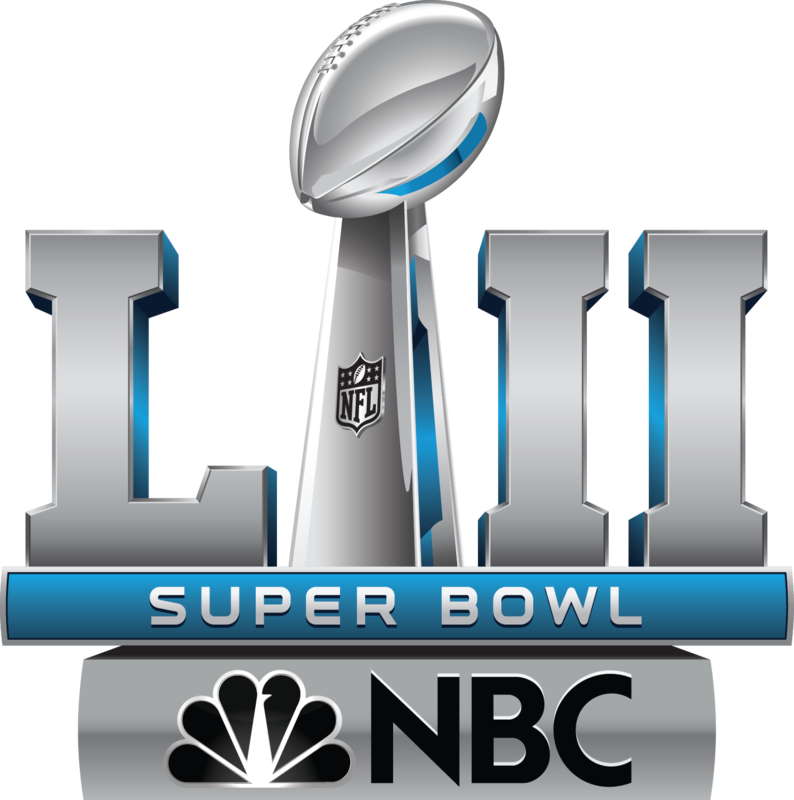 Nonetheless, Super Bowl LII ranks as a Top 10 show in U.S. TV history, and will be by far the most-watched show of the year, more than doubling viewership for the AFC Championship Game (44.1 million on 1/21/18), which will likely end 2018 as the No. 2 program. Viewership peaked at 112.3 million from 10-10:15 p.m. ET during the fourth quarter. Viewership for last night’s game marked a 20% increase from the prior Super Bowl between these two teams, a three-point Patriots’ victory in January 2005 (86.1 million viewers for Super Bowl XXXIX). From 6-6:31 p.m. ET, NBC’s Super Bowl LII Pre-Game Show averaged 64.3 million viewers, a five percent increase from the similar time period last year (61.3 million viewers). The NBC Super Bowl LII Post-Game Show (10:25-10:45 p.m. ET) averaged 73.5 million viewers – the best viewership for a Super Bowl postgame since 2014 and up 20% from last year (61.1 million viewers). Super Bowl LII is the most live-streamed Super Bowl ever, delivering an Average Minute Audience (AMA) of 2.02 million viewers via the NBC Sports app, NBCSports.com, NBC.com ‘TV Everywhere,’ En Vivo app, NFL.com, NFL Mobile from Verizon, the Yahoo Sports app, and go90. Last night’s record-setting live stream peaked at 3.1 million concurrent streams. NBC Sports Digital’s live stream of Super Bowl LII ranks as its most streamed single game ever. Fans consumed 633.7 million live streaming minutes of Super Bowl Sunday coverage across 6.1 million unique devices, up 185% and 112%, respectively, from NBC’s last Super Bowl live stream in February 2015. With 592.1 million minutes, (excluding the post-game NBC Sports stream of “This is Us”), this is also the largest total minutes on record for a Super Bowl. The in-game average minute audience of 2.02 million is up 152% from NBC’s last Super Bowl live stream in February 2015 (800,000 AMA). The Pepsi Super Bowl LII Halftime Show featuring Justin Timberlake, during the 8:15-8:30 p.m. ET quarter hour, was watched by an average of 106.6 million viewers. Telemundo Deportes’ Spanish-language coverage of Super Bowl LII on Universo last Sunday, Feb. 4 reached close to 1.4 million total viewers, according to Nielsen, 10% higher than the cable network’s coverage of Super Bowl in 2015 (coverage included pre-game, Super Bowl game and post-game.) Universo’s broadcast of the Philadelphia Eagles’ 41-33 win over the defending champion New England Patriots averaged 543,000 total viewers (+48% vs. Super Bowl XLIX in Feb. 2015) and 317,000 adults 18-49 (+22& vs. Super Bowl XLIX in Feb. 2015), ranking Universo as the #1 Hispanic cable network during the game. In addition, Universo out-delivered Spanish-language broadcast networks, including Univision, Azteca America and Estrella TV among the 18-49 and 18-34 demos. The network also outperformed English-language broadcast networks Fox and CBS among adults 18-34, and ranked #1 among all cable networks regardless of language in total day, among Hispanic key demos. As part of Telemundo’s marketing efforts to promote the 2018 FIFA World Cup Russia, the network produced a 10-second commercial starring Andres Cantor and his mic-dropping signature goal to run during NBC’s broadcast of Super Bowl. The spot aired during NBC’s second highest-rated quarter hour of the game, averaging 109.3 million total viewers, 11.9 million Hispanics. The Eagles’ 56.2/81 rating in Philadelphia ranks as the market’s best for a Super Bowl. The 55.9/81 in Boston ranks fourth among 10 Patriots’ Super Bowl appearances. Hosted by U.S. Bank Stadium in Minneapolis, the local rating for Super Bowl LII in the Twin Cities was a 54.9/82 – besting by 14% the 48.0/70 rating for the area’s prior Super Bowl (Super Bowl XXVI in January 1992).